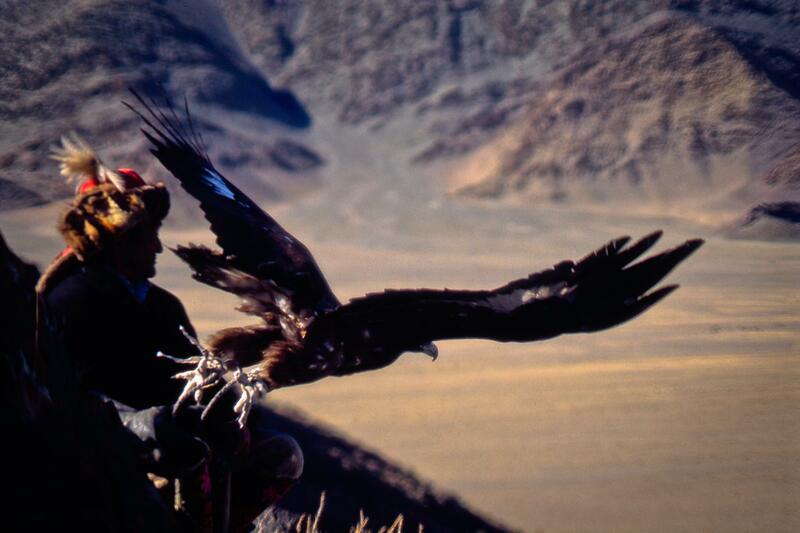 Khuangol is a birkitshi, an eagle hunter. Balapan is his hunting eagle. They hunt rabbit, fox, marmot, ground squirrel, wolf and wild cat. He is single, thirty-one years old. His parents have arranged his marriage. She is 25. She waits for him in the village of Sagsai. Bayan-Ölgii is a province located in the Altai Mountains of western Mongolia—the wild wild frontier where China, Kazahkstan, Mongolia and Russia meet. 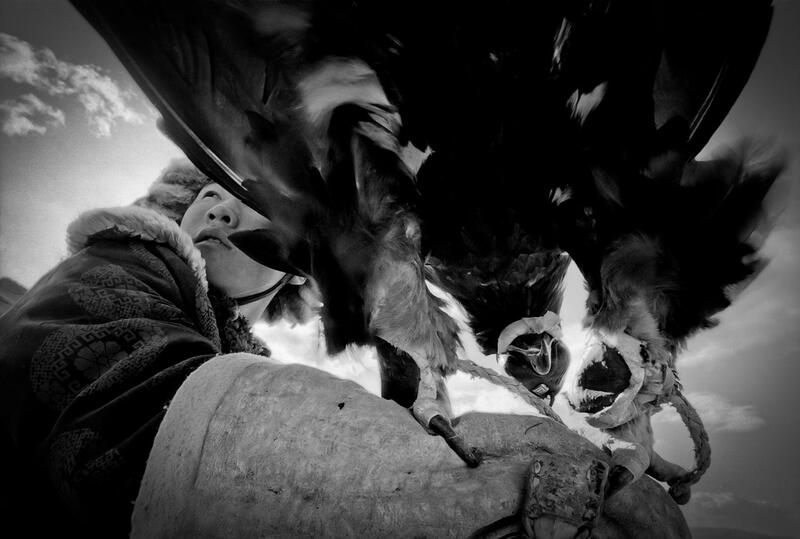 Here live an estimated 250 birkitshi—eagle hunters maintaining a 4000 year old tradition of hunting with birds of prey. 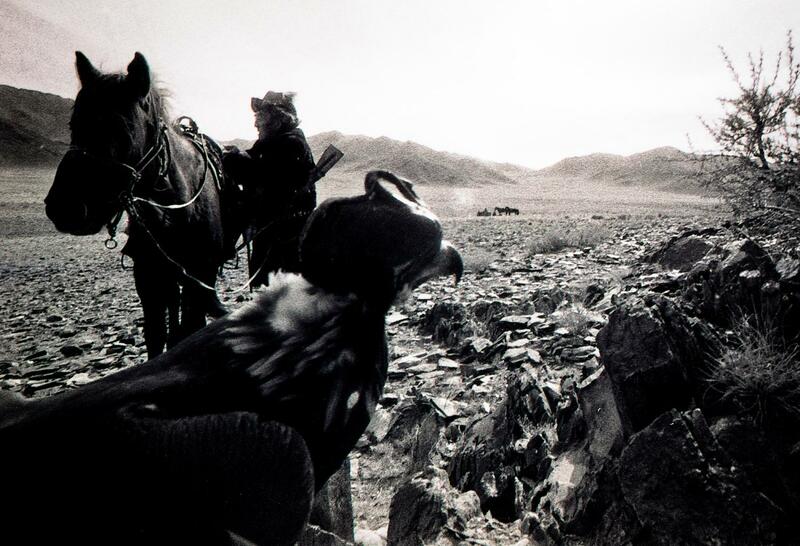 They hunt on horseback using golden eagles, falcons and owls to locate and catch red foxes, corsac foxes, wild cats, marmots and smaller mammals hardy enough to survive the harsh Altai climate. 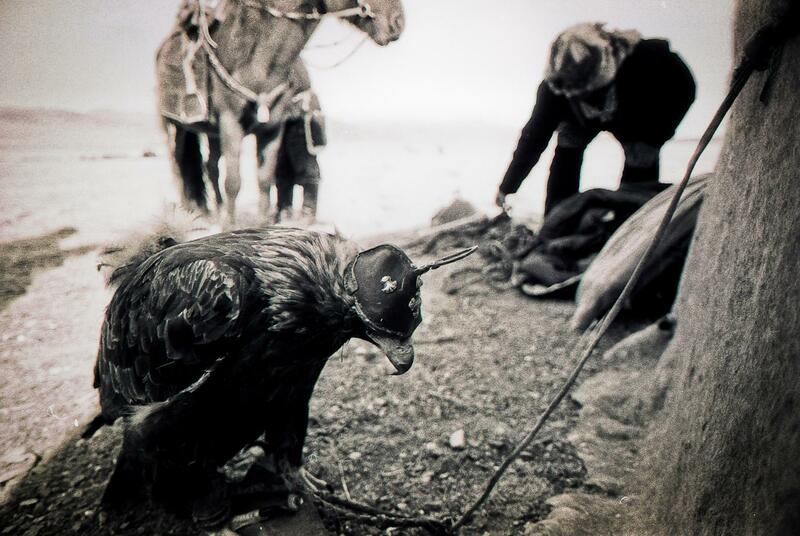 They are known as "eagle hunters" and their way of life and traditions are threatened by the influences of modernity. The long Mongol steppe concludes at the frontier with the far western province of Bayan-Olgii. The land is vast and the winters vaster. Killing droughts come with the ghang jud, where summer sunshine scorches grasslands, and the qara jud, a snowless winter in a waterless desert. Torrential rains bring floods. The caghan jud is a blizzard of starvation and the tugharai-yin jud brings another kind of hunger: too many cattle or horses, thousands of hooves ripping apart the land; too many sheep or goats, devouring every last grass. Winter plunges the mercury to minus 35 or minus 40—the killing temperatures. 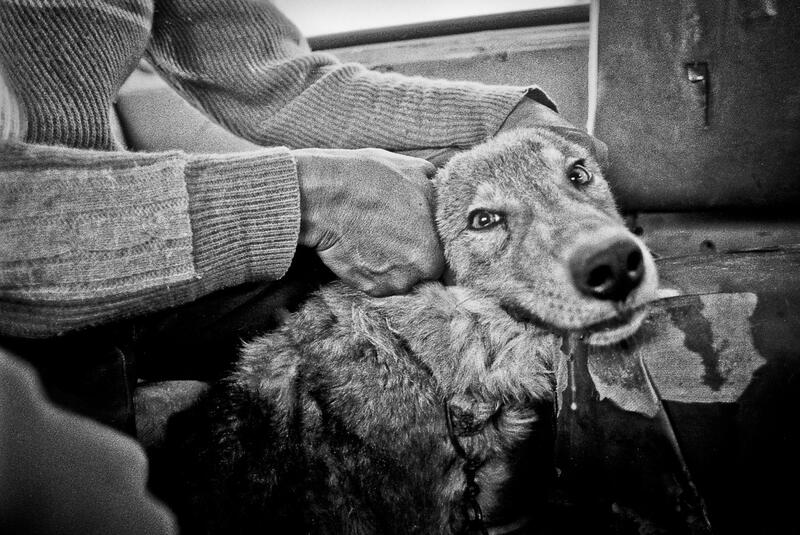 Whole herds vanish overnight, and with them the livelihoods of whole families. 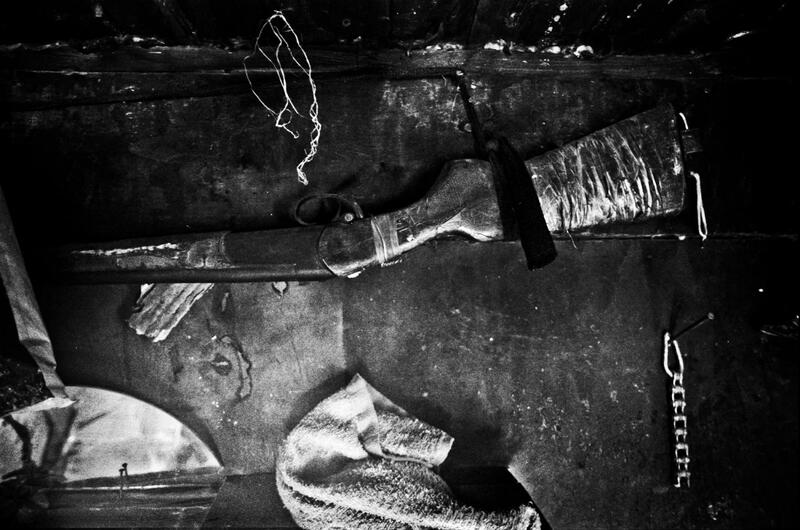 The birkitshi make their own clothes and horse tack out of skins and furs. The birkitshi hunt smaller game, mostly. A typical year's harvest would be, say, 20 fox, 30 rabbit…a handful of buck-toothed marmots. They sell enough to eke a bit of joy and prosperity out of a mean and lovely land. It is never easy. 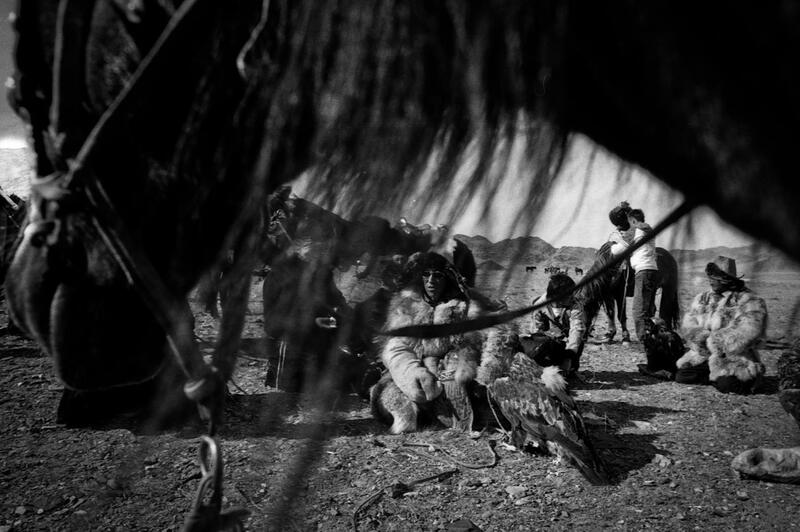 A birkitshi tends his animals outside a ger set up for nomadic excursions. A rabbit that fell prey to an eagle's talons lies outside a ger where the birkitshi who owns the eagle will make a meal of it. 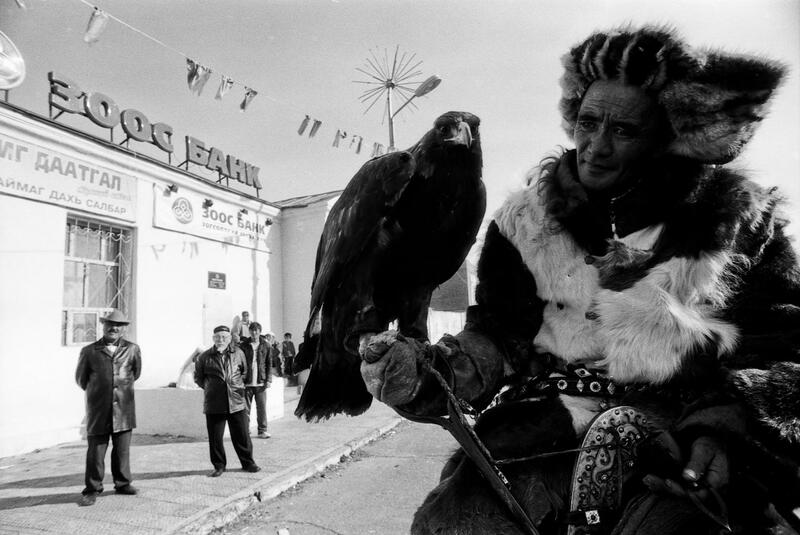 Every year in the fall a number of birkitshi gather for an annual eagle festival, a serious event that brings cash prizes and great recognition and stature to the most skilled eagle hunters. 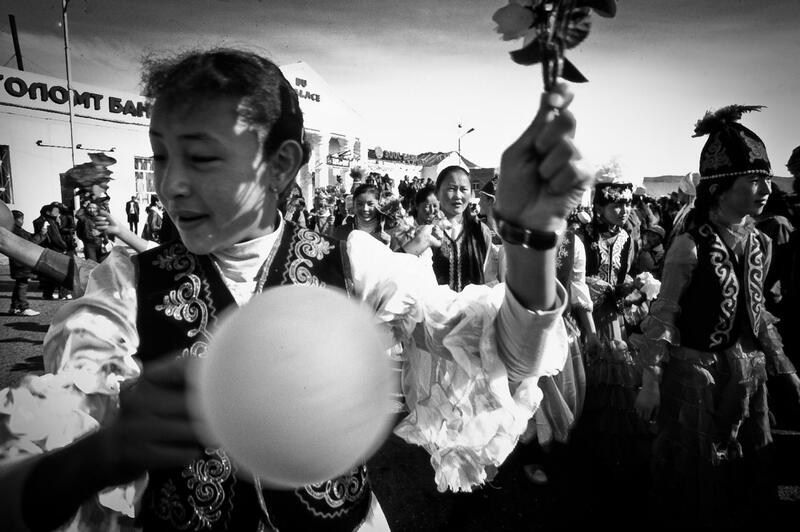 Dancers, singers and musicians and balloons set the stage to begin the annual eagle hunter's festival. 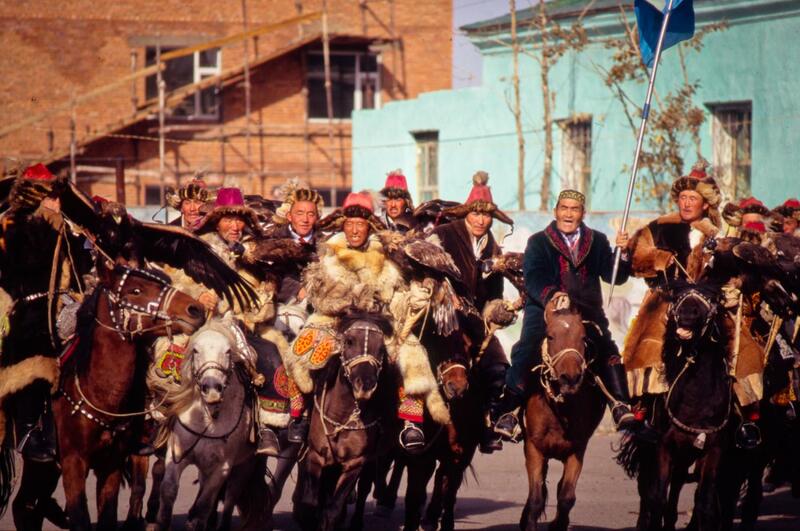 The birkitshi set off together in a wild gallop on route to the site of the year's annual eagle festival. Judges at the annual eagle festival study every movement and action of the eagle, horse, rider and the dynamics, communication and cooperation between them. 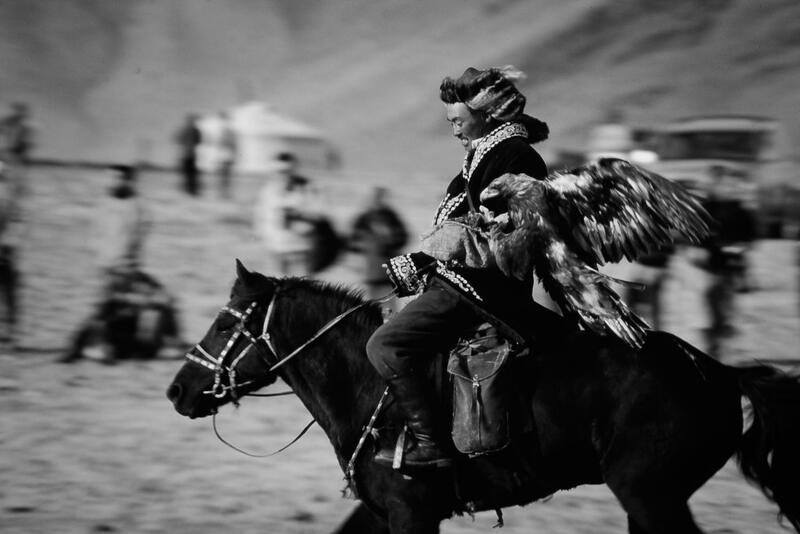 A birkitshi can run a horse at a full gallop, the eagle balancing on its baldahk. 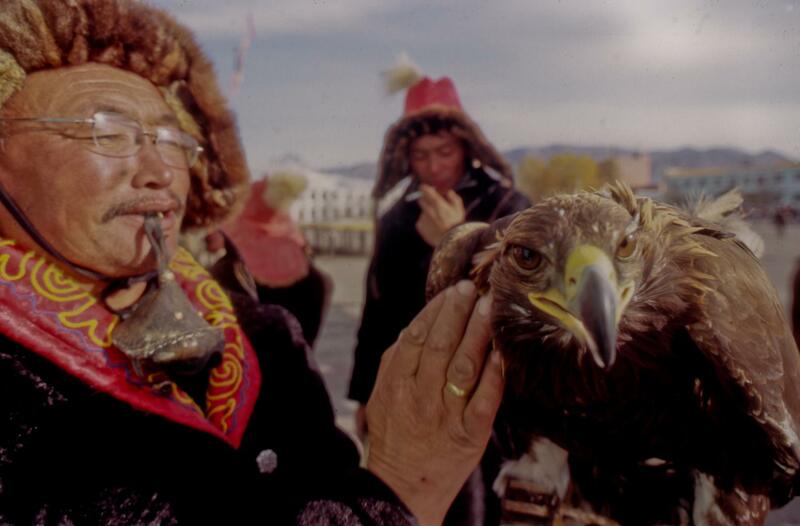 The eagle festival is a tourist event that revives and validates a disappearing culture. This year, Khuangol’s eagle Balapan caught the wolf in a show hunt for tourists. 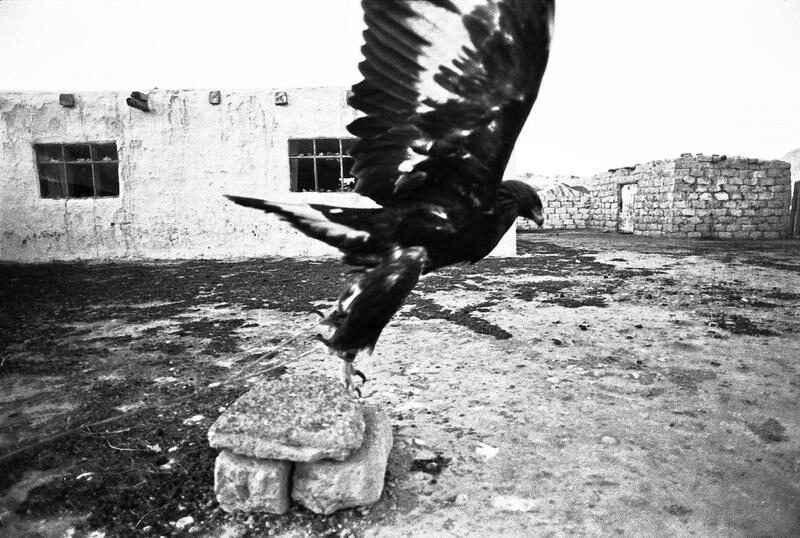 It was a sorry looking wolf, doomed to be attacked again and again as each eagle hunter and eagle take their shot at proving their prowess and skills. 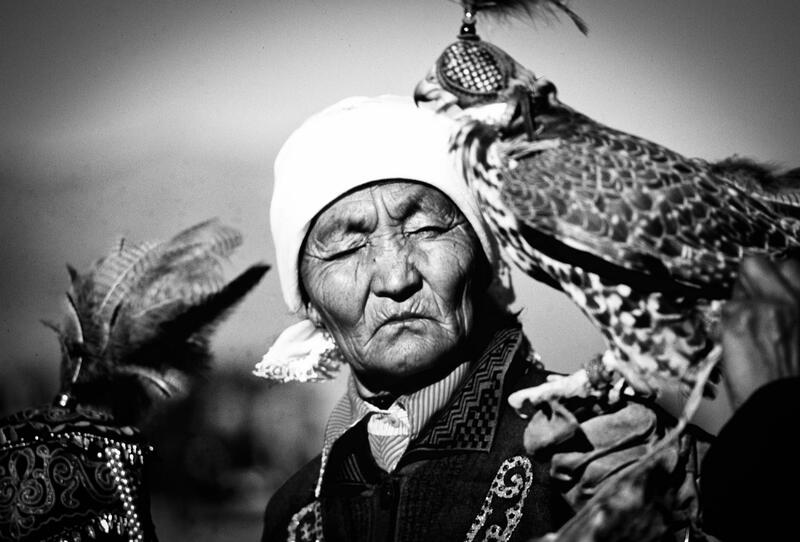 Birkitshi share a strong comraderie, the keepers of the wild cultural flame of their long 4000 year-old tradition of eagle hunting. 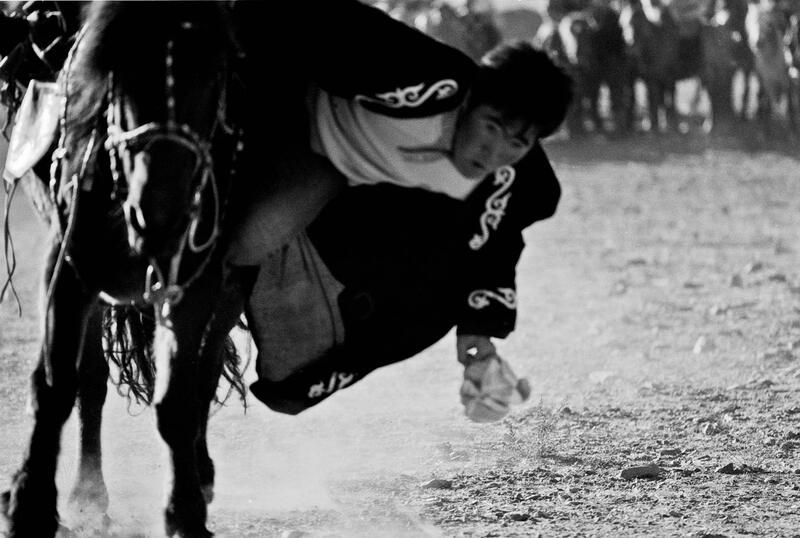 Riders often wear an elegant del, the knee-length Mongolian national gown bound at the waist by a brightly colored sash, and horse and rider have all the standard nomad accoutrements, plus some eagle extras. Bridle, reins, stirrups, saddle. There is a horsewhip made of wood and leather. A hood that covers the eagle’s eyes. 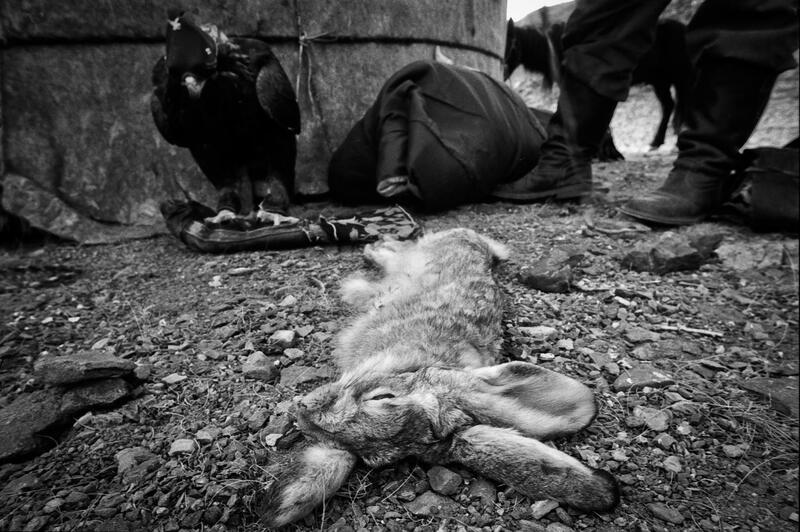 An animal carcass—dried dead rabbit—pulled behind the horse to retrieve the eagle. A coiled up lasso, handmade, rawhide, hangs from the saddle. 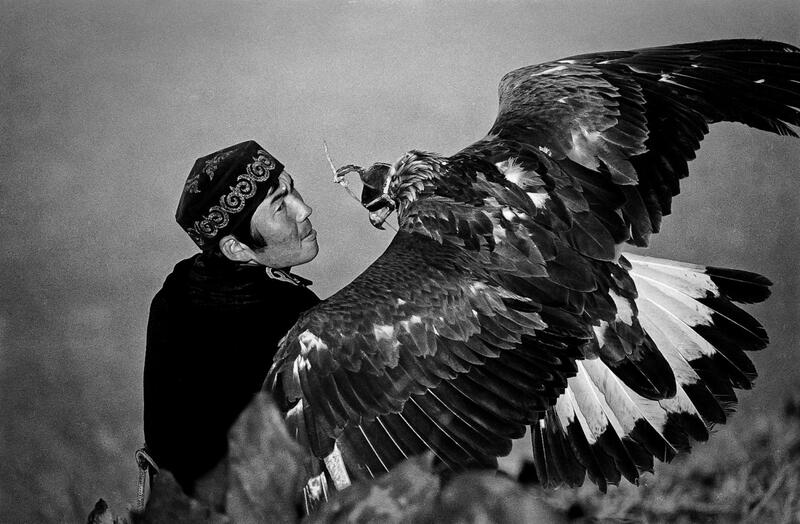 A kazahk woman—females are rare amongst the birkitshi, as the documentary film "The Eagle Huntress" makes clear—displays her bird of prey, a falcon. 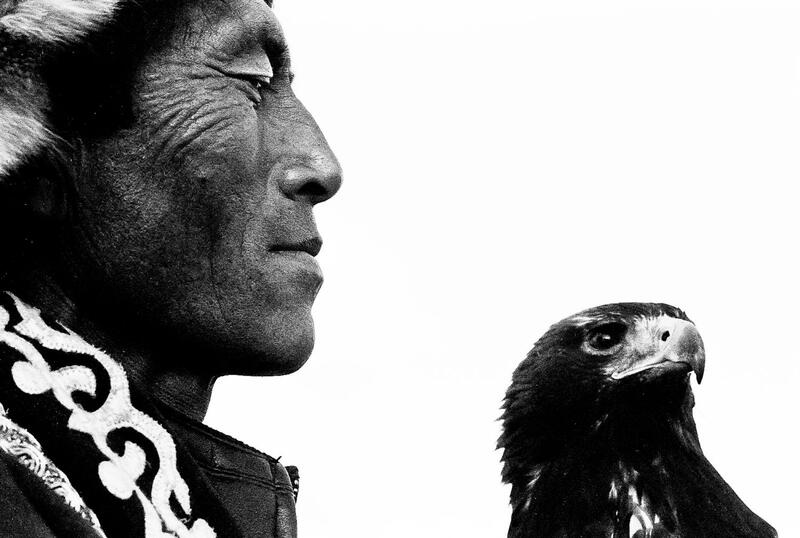 A hunter launches his eagle from atop a mountain in the Altai. 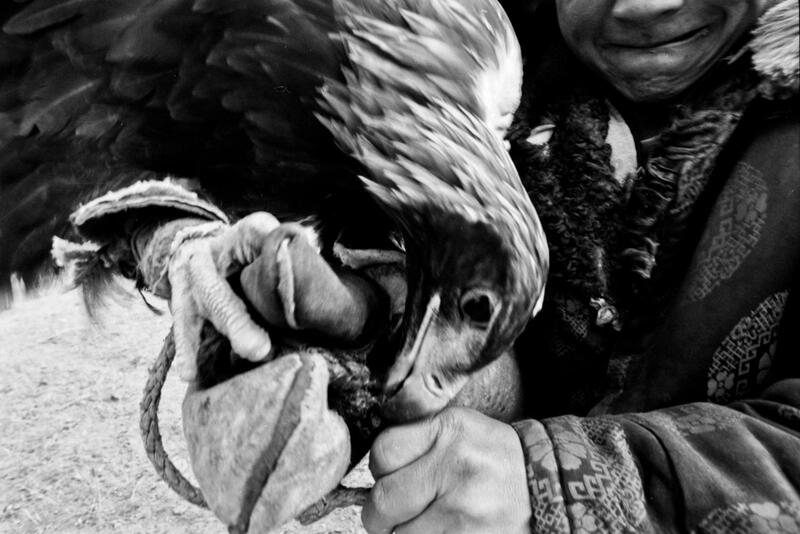 Eagle and it's owner have a tight, lasting relationship and a special bond. A young eagle hunter demonstrates his horsemanship skills—hanging low off his horse and snatching something off the ground at full gallop—at the annual eagle festival. 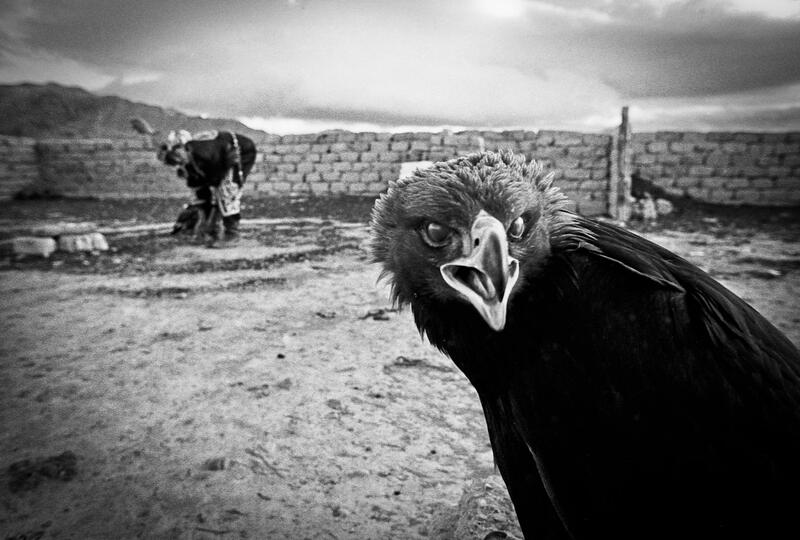 Tourists and locals alike are advised to shed any clothing or other adornments that display red or orange colors, because the eagles are drawn to these, linking the color with prey and blood. 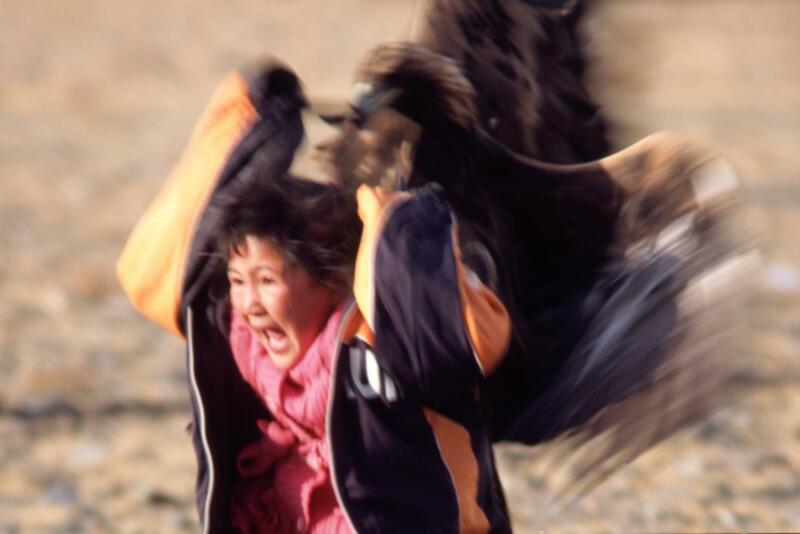 Here, a young girl watching the eagle festival fell prey to one of the eagles—strong enough to topple the girl off her feet. 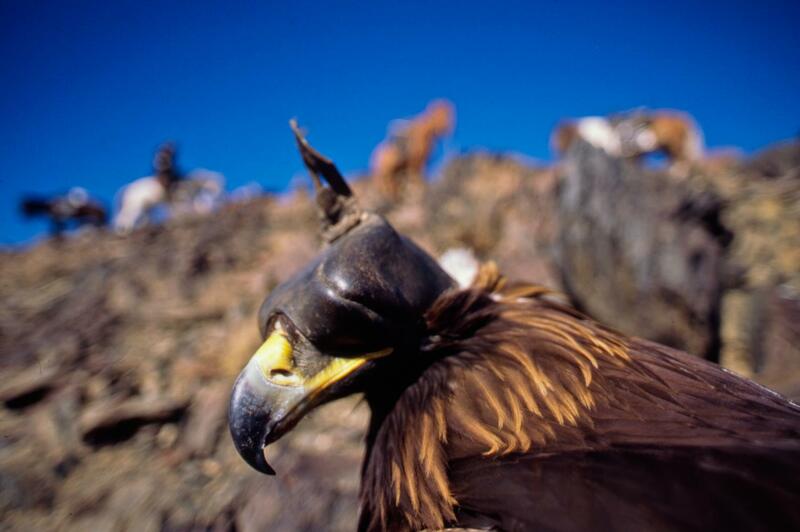 Khuangol's eagle Balapan waits quietly, blinded by the leather eye-peices used to keep these wild creatures calm. Their gloves are sometimes made from the skin of an elk. The eagles are heavy, strong, fierce, wild birds of prey. 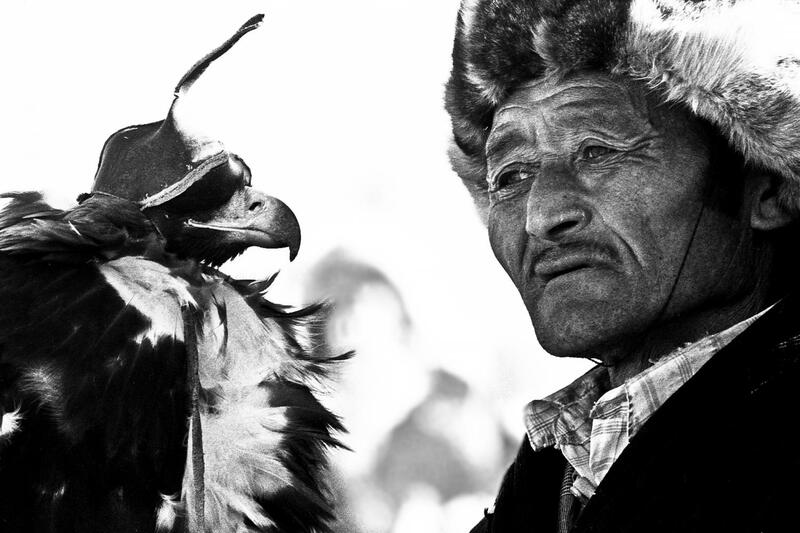 Once an eagle catches its prey, the birkitshi must quickly ride to the eagle and wrestle the prey from the talons and sharp beak of the bird, else the bird will tear the prey to pieces. 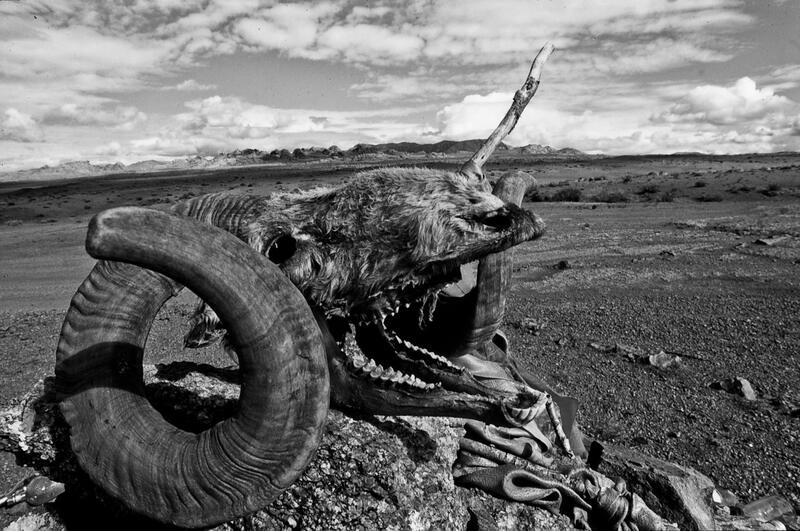 “My arm gets very tired holding eagle,” Khuangol admits, “even with baldahk.” His baldahk crutch is crafted from the antlers of the endangered Ibex goat of the Altai range. Draped over the horse, Pony Express style, are leather saddlebags. 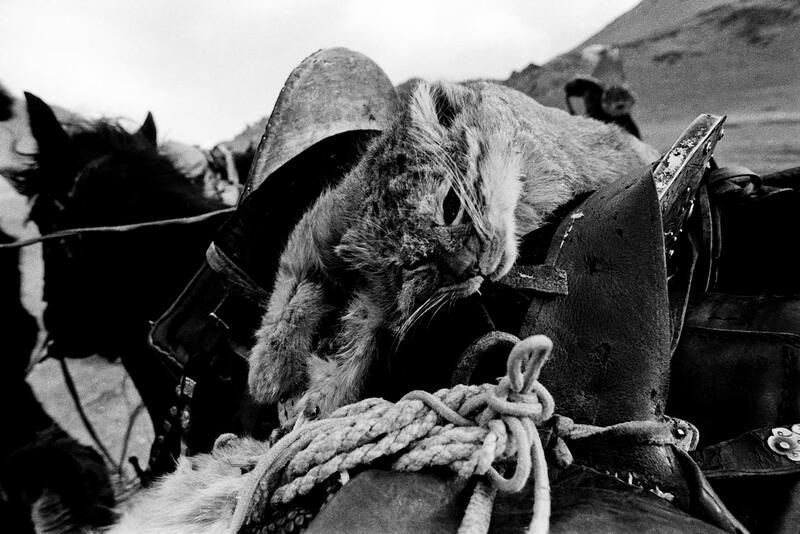 Slung over these is the furry carcass of a wild cat caught by Balapan when Khuangol flew her in the mountains. It’s an Asiatic lynx, lacerated at the neck, dripping blood. 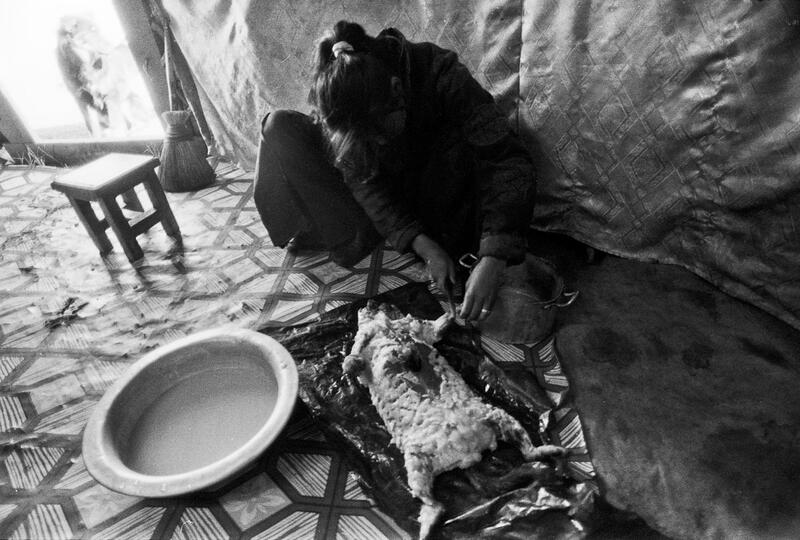 A young woman skins a marmot in the family's ger (yurt), temporary shelter during nomadic forays into the mountains. As the sun sets, I am invited to sleep on the floor of the ger. Dinner is boiled marmot. Served cold. You spot these empty eye sockets and buck-teeth looking back at you from the aluminum pot. Best damn marmot you ever 'et. 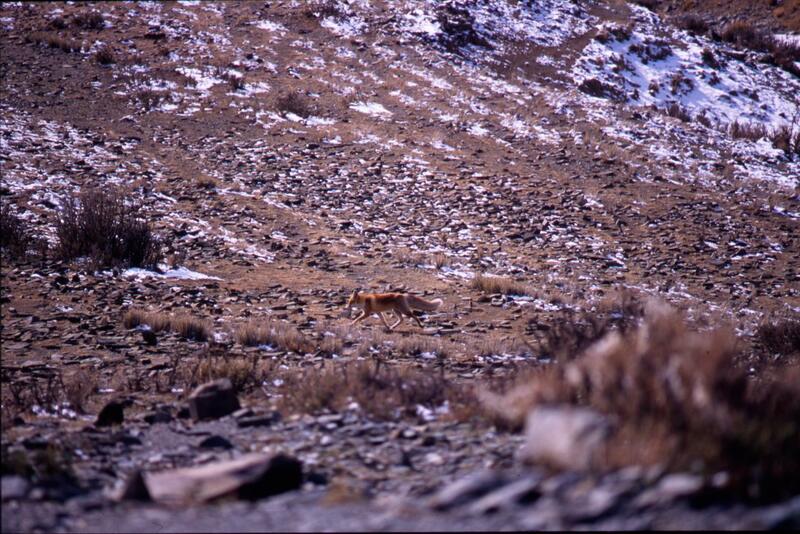 A wild corsac fox, otherwise called a "corsac", is a medium-sized fox hunted by the birkitshi. It is found in steppes, semi-deserts and deserts in Central Asia, ranging into Mongolia and northeastern China. Khuangol's eagle Balapan is impatient, launching itself off its perch in anticipation of regaining its freedom. 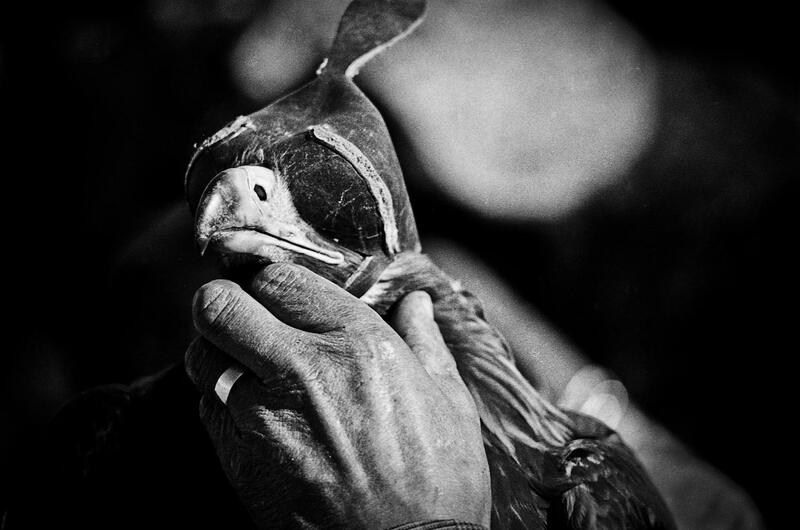 The birds are loyal to the birkitshi, trained from a young age to return home. Sometimes, though, they fly off and are never seen again. 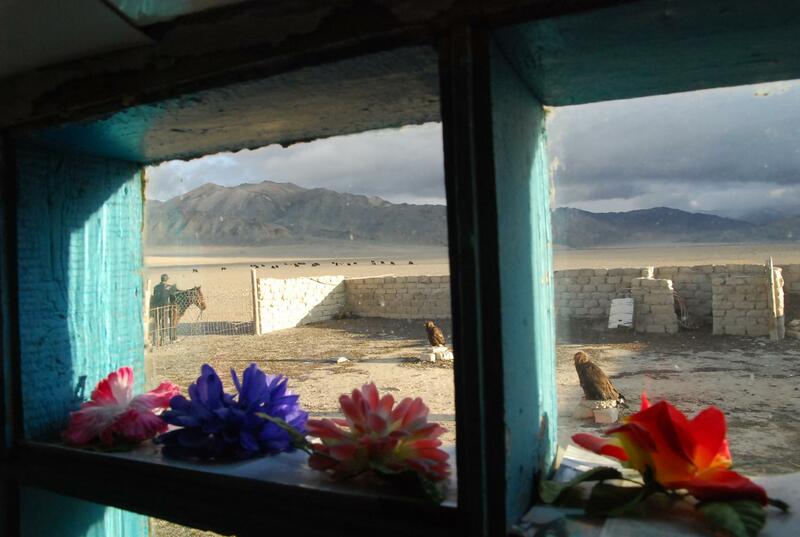 Khuangol tends his animals outside his home, his goats and sheep in the distance, his eagles moored inside the compound where they must be kept safe from four-legged predators prowling at night. 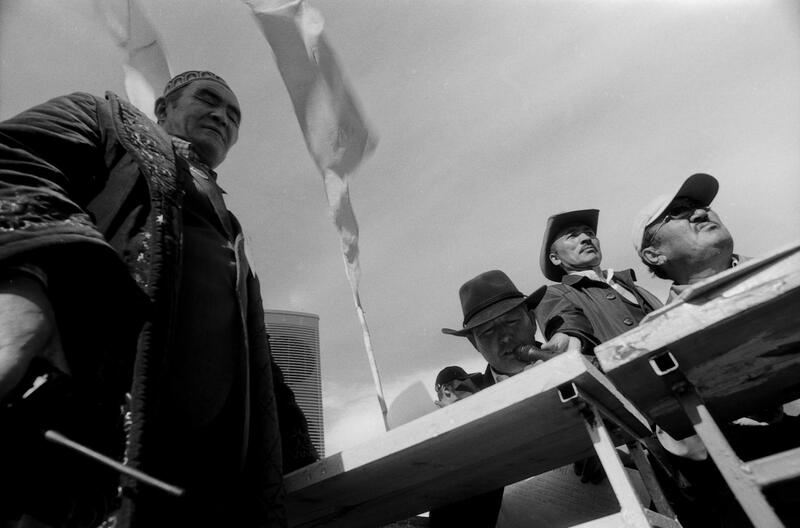 The birkitshi have few possessions. Rifles are used to supplement the hunting, and also to protect the eagles and livestock from the large predators of the Altai, such as the snow leopard and wolf. The birkitshi are rich in culture and tradition, but they are also land poor—they may have land, but they have little cash. A young eagle hunter looks out over the mountains, calculating the best site to partake of the hunt.